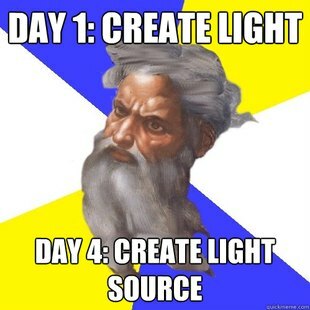 Creates Light, and Day and Night, in Day 1... doesn't create Sun and Moon until Day 4. How can I have been in and around the Bible for decades, and never noticed the totally bizarre concepts in the first chapter of Genesis? “And God said, Let there be light… and God divided the light from the darkness. And God called the light Day, and the darkness he called Night. And the evening and the morning were the first day.” Genesis 1: 3-5. “And God said, Let there be lights in the firmament of the heaven to divide the day from the night… And God made two great lights; the greater light to rule the day, and the lesser light to rule the night: he made the stars also… And the evening and the morning were the fourth day.” Genesis 1: 14-19. I’m still pondering this! Day 1: he makes Light, and Day and Night, and morning and evening. (Day 2, he makes heaven and sea and earth. Day 3, he makes grasses and fruit trees.) Then, on Day 4, he makes the sun, moon and stars…?!? How could even an unscientific, preliterate, myth-creating narrator come up with something as nonsensical as that? (If Day and daylight are independent of the Sun, does the author of Genesis think that it is purely coincidental that daylight and the appearance of the Sun occur together?) Or how could even the worst story-reteller garble a narrative that badly in writing it down? And how the hell can ultra-Orthodox Jews and fundamentalist Christians believe that every word of the Bible as we have it today is literal fact? This entry was posted in Fiction, Novel, Religion and tagged Christians, day, Genesis, Greeks, Jesus, Jews, Let there be Light, Romans, sun, ultra-Orthodox. ← Scientology clergy member attacks church leader’s ‘obsession’ with money. Ha!